You know I wish that I had Jessie's girl. I wish that I had Jessie's girl. Where can I find a woman like that? You know the song, right? I think this song was released before I was born, but somehow I have heard it enough that the chorus got stuck in my head while I have been excitedly making Jessie tops over the past few weeks. I think in my head, though, the lyrics sounded more like - I want to make all the Jessie tops. Where can I find the time to do that? Well, God was gracious to me because I found the time to sew up 3 tops! I am so excited to share with you all the details of this fun pattern. When Rachelle from 5 out of 4 patterns initially showed a preview of the back of the new Jessie top, I am sure my jaw dropped. 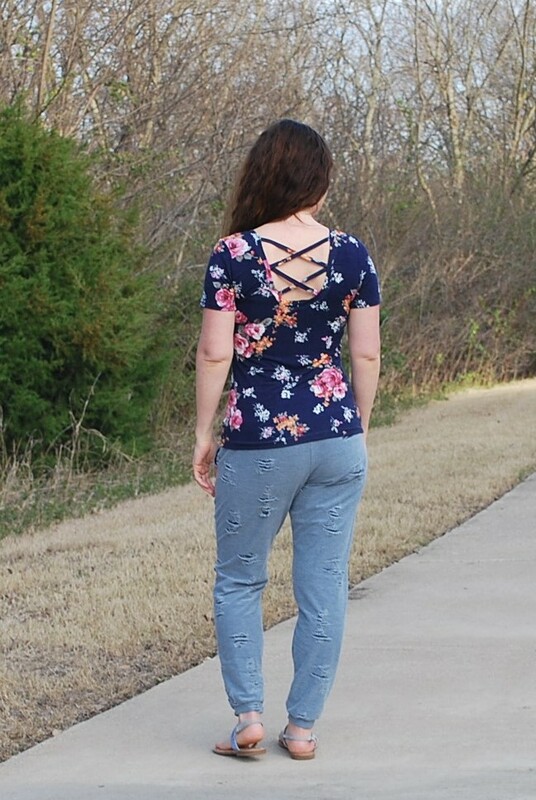 I am such a sucker for a well fitting tee, and I just loved the fun back details. The Jessie pattern is a slim fitting pattern that can be made into a top, tunic, or dress. There is one neckline included in the pattern for the front, and the back has 4 options to choose from - high, low, strappy, or racer back. There are also 4 different sleeve lengths so the pattern works for all seasons. You need to use a light to medium weight fabric with at least 50% horizontal stretch. I chose a rayon spandex for all 3 of my tops. My first Jessie top was a high back top so that I could quickly assess fit to see if any changes were needed. I used a wide stripe fabric that I found in my stash and have no memory of buying. The wide stripe made it easier to pinpoint exactly where my bra strap hit on this pattern. I saw that my bra line was at the fourth stripe. When I took my top off, I transferred this to the pattern and knew that I needed to raise the low back by 1.75 inches for my next top. I liked the way everything else fit so I was good to go for my first top with a fun back. Sizing: I made a straight XSmall without any adjustments. I chose the size to make by selecting my overbust + 2 inches. My overbust is 32 inches, and my full bust ranges from 34-36 depending on when the last time that I fed the baby. Waist is 27.5 to 28 inches and hips are at 36.5 inches. Fabric: I immediately thought of the rayon spandex that Ti carries at Simply by Ti. It is such a great weight and is perfect for summer. 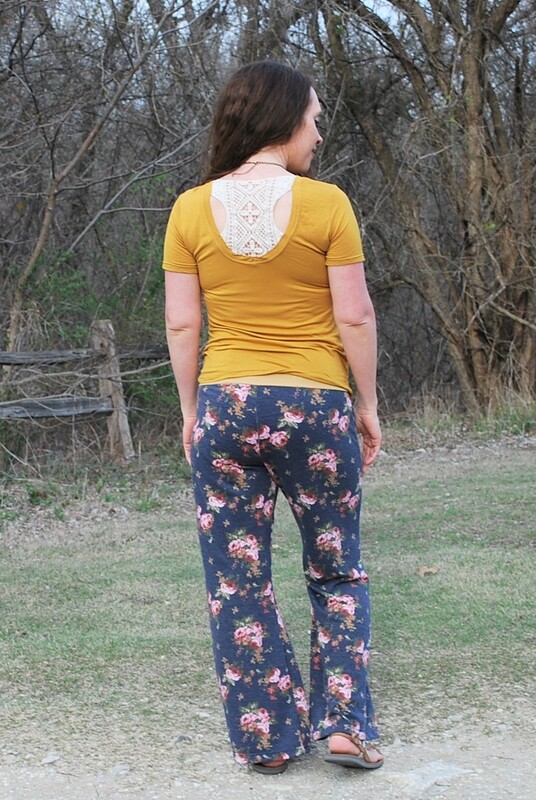 The floral that I used on this first top can be found here. Adjustments: I lowered the neckline on this top 1.5 inches so that I could easily pull down to breastfeed. I marked a place 1.5 inches lower and then just smoothed the curve out, keeping the shoulders the same. This is a very easy adjustment to make after making an initial top to see just how much you need to remove. One thing to keep in mind when lowering the neckline on this pattern is that you probably also do not want to have a low back that is open. You need a racerback, straps, applique or something to keep the shoulders of your top up. If you choose a lower back neckline and a lower front neckline, you may have a wardrobe malfunction or constantly have to readjust your shoulders to keep them in place. Even a simple strap at the back will help you if you choose to lower your front neckline. Since I had raised the back by 1.75 inches, I only used 4 straps and re-measured my placement marks to make sure they were even. The pants I am wearing with this are my ever faithful Brassie joggers in a distressed knit from Mily Mae. I made a size small (based on my maternity measurements) and used smaller cuffs on the legs. I have worn these all throughout my pregnancy and now am enjoying them postpartum. I need to get more distressed knit and make more! I love the look of appliques but had never used them because I did not quite have a top pattern that screamed "I need an applique!" Well, this Jessie top is perfect for appliques! For this top, I wanted a simple solid top that would coordinate well with lots of pants in my closet. I am not always very capsule minded, but I am trying to slowly add versatile garments that work well with many outfits. Fabric: I also used Simply by Ti Rayon Spandex on this top. They had the exact color of mustard I wanted. It is just dark enough that I don't feel washed out in it. This color can be found here. The applique came from Wherehouse Fabrics in Dallas. My fabric is a tad wrinkled in the back because I breastfed right before this photoshoot! I did not lower the neckline on this top because it was early in testing and I did not want to make personal alterations yet. I didn't notice that I had not pulled my top down very well in the back before shooting photos. Whoops! Now, let's talk about my pants! These are the Portlander Pants by New Horizons. These are quite my favorite because they went from pregnancy to postpartum feeling oh so nice. They are like secret pajama pants. One day, they will get their own blogpost when I finish making more. The fabric is French Terry Nala by Sincerely Rylee. You can purchase the Jessie pattern here. I can't wait to see what you make! Why have I never thought to use stripes to help me figure out where to scoop out necklines? Brilliant!